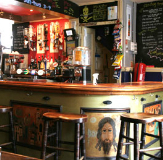 With its “friendly food… tasty bar staff” sign, the Mash Tun is one of the best-known pubs in Brighton and has become a local landmark as well as one of the town’s most popular meeting points. They also have a good daytime trade, serving food including their famous burgers from Burger Kult. The upstairs, with its comfy seating, offers a mellower retreat from the main room, whilst there are also tables on the pavement in front in the revamped New Road – a major people-watching spot in summer. The pub also holds occasional theme nights (beach parties, Christmas and Halloween events) and has a very late license, staying open until 3 or 4am if the demand is there.